This article originally appeared in the summer 2014 Harker Quarterly. 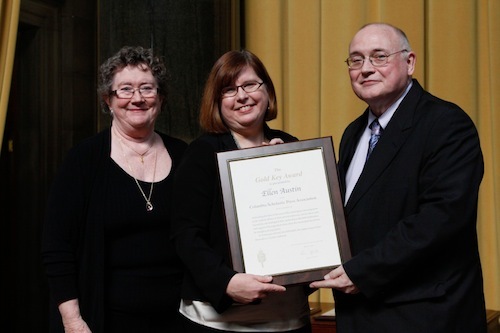 In March, the Columbia Scholastic Press Association (CSPA) recognized upper school journalism teacher Ellen Austin with a Gold Key Award for excellence in journalism at the CSPA conference, held at Columbia University in New York City. The Gold Key, which dates back to 1929, is the CSPA’s highest honor. “The joy in watching a developing young journalist find his or her voice and being a part of helping him or her find a stance in the world is an incredible experience,” said Austin upon receiving the award.